Colin Feltham’s contributions to the counselling world are well respected and so many might find his latest book significant. Writing in a very ‘readable’ style, Feltham offers us his critical account of counselling’s history, its theories, its practitioners, and above all, its flaws. However, the defects in the counselling profession have long been debated and this book seems to add little that is significantly new to that discourse. What it does do, and does well, is to bring many of the current arguments together. Therefore, although this text appears to be summative rather than formative, it might nevertheless prove to be a useful resource guide. Chapter 1 is an overview of the historical roots and later development of the psychological therapies. Although offering us a fairly interesting ‘take’ on the topic, this section would have been strengthened had it offered a little more evidence-centred debate and been a little less polemical. For example, Feltham’s controversial claims that psychotherapy and psychoanalysis have mainly developed outside the world of psychology or that the talking therapies have developed in a ‘zone of combined entrepreneurial and folk-psychological interests’ (p8) might have been of more value heuristically had they been backed by more extensively sourced evidential support. In Chapter 2, Feltham evaluates the true ‘greatness’ of counselling’s key ideologues. Actually, he only confirms what we already know: that these ‘greats’, sometimes seriously flawed personally, all too often used and abused cherry-picked data to doggedly defend their self-proclaimed doctrines and to make challenging assertions. Feltham suggests an interesting list of questions that we might use to better re-assess those leading opinion formers and the quality of their work (p26). Of course, Feltham too is an important opinion former. Therefore, it would have been a fascinating addition to this chapter had Feltham reflectively reviewed some of his own theorisings against his suggested questionnaire. Chapter 3 of this book critically examines counselling theory which, he suggests, is a mess, confounded by conflicting dogmas and muddied by significant omissions in its teaching. Feltham wonders if we will ever ‘clean it up’ (p70). However, it is arguable that Feltham is possibly being unduly pessimistic. After all, a number of modern theorists, (McLeod, Cooper, Gilbert, etc) have suggested various possibilities for rationalising counselling theory. A discussion of some of these proposals would have strengthened this chapter. Chapter 4 reviews the professionalism of counselling’s practitioners and assesses their inadequacies. Counsellors themselves, Feltham argues, are ‘socialised into their professional mind-sets’ (p81) in a variety of unconnected ways and operate in a disparate ‘array of settings’ (p87). 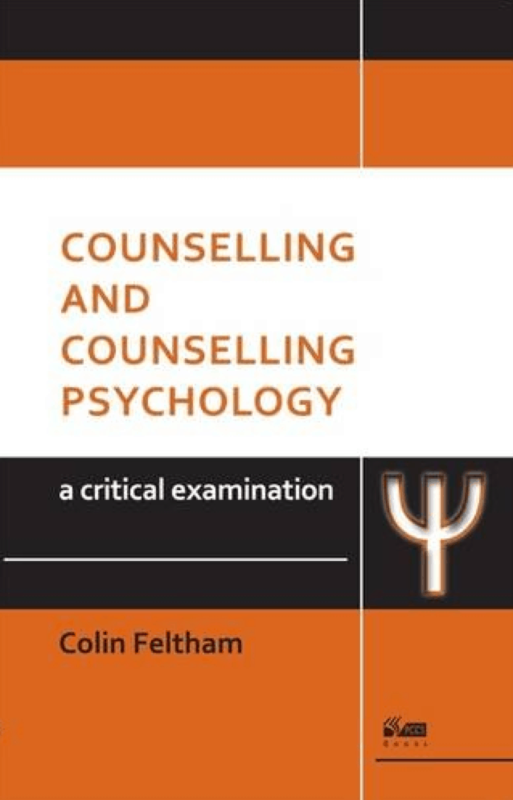 Therefore, Feltham claims, counsellors exist in a world that owes more to theoretical chaos than to theoretical integration, a world that is fuelled by ‘an endless supply of human misery’ (p105). However, later in this book, Feltham overcomes this theoretical ‘nihilism’ by acknowledging the beneficial intents of counselling’s practitioners. How they ever manage to help anybody he does not know, but help they apparently do. As he says on p185 ‘Can millions be wrong’? In Chapter 5, Feltham reviews the contributions that research has made to the evolution of counselling. Apart from noting that overall the conclusions are generally friendly, Feltham’s view (in this book at least) seems to be that the research to date contributes little and is relatively meaningless. However, much of the apparently anti-research advocacy explored in this chapter seems to owe its provenance more to sociological and political theorising than to a consideration of competing philosophical differences. There is an arguable case for promoting a pro-research, scientist-practitioner ethos in counselling and this chapter is weakened by excluding much of the relevant discourse. Feltham’s thoughts in Chapter 6 about the training and professional recognition of counsellors are of interest. This is especially so when he points out the weaknesses of the present accreditation and regulation systems. With regard to understanding and explaining the issues affecting counselling as a professional calling, Feltham himself says that he has ‘no hope of getting anywhere near the bottom of all this’ (p151). He therefore offers us little in the way of speculation on possible ways forward apart from an unsupported claim that counselling’s difficulties in establishing a professional identity apparently stem from it being a supposedly matriarchal discourse that conflicts with an allegedly patriarchal world (p43). However, as a respected and knowledgeable theorist and academic, Feltham clearly could have told us much about the ways in which counsellors might establish their own discrete disciplinary boundaries. This chapter would have been more informative had he done so. Finally, In Chapter 7, Feltham summarises his critique of counselling in terms of its yet many unresolved problems and asks if the profession can retain any credibility. (p177). Readers of this book will certainly be left wondering. Feltham strongly denies that he is a counselling cynic (p189) or that he rejects counselling as way of being. However, the overall narrative in this book seems to be that Feltham considers the counselling profession to be seriously wanting. Fortunately for the Talking Therapies generally, none of the issues that Feltham discusses in this book are particularly new and anyway at least their clients seem to find them helpful. Presumably, as long as ‘what works, works’, we need not be too despondent. Therefore this is a book that seems likely to be of more use as ‘suggested additional reading’ than as ‘core text’.